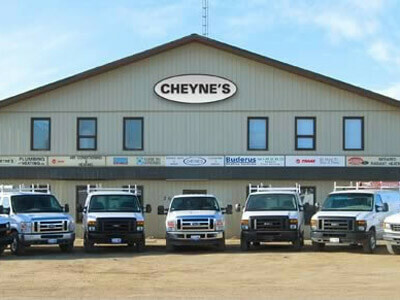 Commercial Plumbing | Residential HVAC | Cheyne’s Plumbing and Heating Ltd.
About Cheyne’s Plumbing and Heating Ltd.
Beryle and Les Cheyne founded Cheyne’s Plumbing and Heating Ltd. in 1979, and established the business at its current North Battleford location in 1986. For over 30 years we have provided residential and commercial customers throughout the area with expertise in building and renovation projects. Our highly trained and talented technicians specialize in HVAC and plumbing jobs, and they are all HRAI certified. With our many years of industry experience combined with our professionalism, you can ensure our team will perform your HVAC or plumbing project to your highest standards and exceed your expectations. Our professional team of certified technicians is ready to take on any commercial or residential HVAC or plumbing job, large or small. With our accurate estimates, there are no surprises when we draw up your bill. Home improvement financing is available for up to $35,000. Call us today to get started on your plumbing, heating or cooling project. In case of emergency, we are available for 24 hour emergency service.